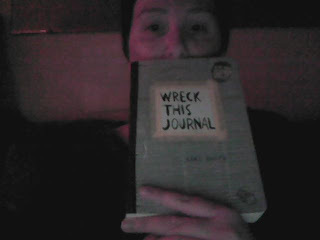 I have been seeing around the internet, videos and blog posts about the "Wreck this Journal" book. It's suppose to be a creative way to let off some steam and find you're inner artist. I had made up my mind about two months ago, that I wanted one. Only they were sold out constantly. Well, guess I was meant to have one of these, because I was given one yesterday as an early x-mas gift from my mom. Now I can be my destructive self with purpose. Honestly, I'm hoping it helps to break me out of this writer's block that I seem to have been in for... way way too long. And after flipping through it, and trying some of the less messy pages, I understand why people are documenting their journey through the journal on videos. Some of the things are so crazy, no one would believe you actually did them unless they saw it for themselves. If you haven't seen this journal, youtube it. Search your Bing or Google or what have you, and you'll see what I mean.